State of Joshi: Oedo Tai and Yoshiko! The State of Joshi: Oedo Tai, The Kimura Family, and Yoshiko! It has been awhile since the first State of Joshi Column, over four months actually, but we are back with more of my thoughts from the world of Joshi. Needless to say a lot has happened in the meantime so lets get right into it. I mentioned in the first State of Joshi column that Threedom was dominating Stardom too much and other wrestlers needed to be given a chance, but as I accurately predicted that issue has been resolved. Just a few months ago, all the titles in Stardom were held by Io Shirai, Mayu Iwatani, and Kairi Hojo. While they still hold the singles titles (one apiece), they have lost the Goddesses of Stardom Championship (formally held by Mayu and Io) and the Artist of Stardom Championship (all three) to Oedo Tai since June. Kyoko Kimura and Kagetsu hold both titles, with Hana Kimura joining them for the trios title. This was a necessary move for Stardom, for a number of reasons. There was always the injury concern, when three wrestlers hold eight titles it can lead to a lot of vacant belts if someone gets hurt. Io did miss about a month in the summer due to an injury, but luckily it was minor. Still, it showed why it isn’t a great idea as Io and Mayu both had three titles. Also, since all of Threedom were so hard to pin, it was creating too big of a gap between the top of the card and the midcard. While Oedo Tai is still a fun midcard act, they have now also shown they can win, and they will no doubt have entertaining feuds with the rookies such as Kyouna, Momo Watanabe, and Hiromi Mimura for their newly won titles as I imagine Threedom will generally stay away from the tag belts in 2017. While Stardom is far from a perfect promotion, they have at least made strides in getting a better belt distribution which can only help the promotion down the road. 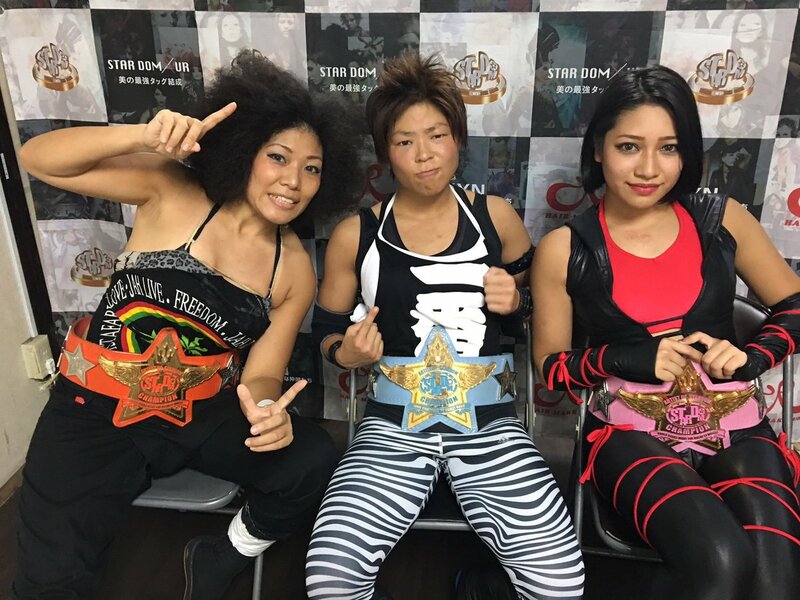 I touched on it a bit above, but Kyoko and Hana Kimura aren’t only having success in Stardom. Besides winning championships in Stardom, both Kyoko and Hana have won titles in JWP as well. 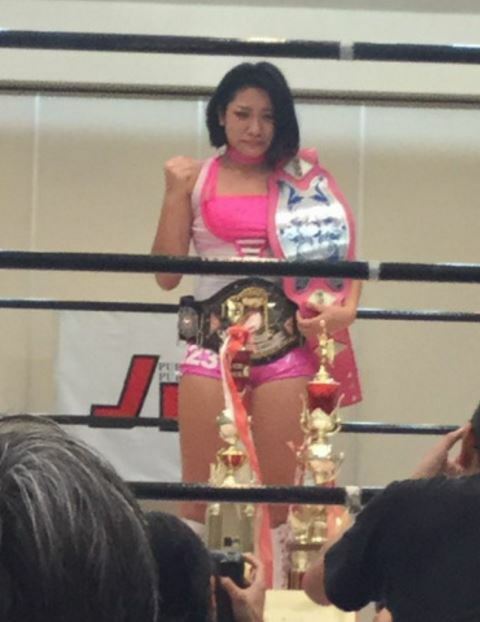 Hana Kimura won the JWP Jr. Championship and the Princess of Pro Wrestling Championship on September 18th, defeating Yako Fujigasaki. Kyoko Kimura also did well for herself, as on October 9th she defeated Arisa Nakajima for the JWP Openweight Championship. Kyoko also holds the JWP Tag Team Championships (with Hanako Nakamori), meaning that the Kimura Family currently holds every active championship in JWP. This is extraordinary for a number of reasons. First of all, while I didn’t do an awful lot of research, I don’t think that a mother/daughter team has ever held a title together before. At least not for a major promotion. Also, Hana Kimura is only 19 years old and in her first year of wrestling, and yet already is holding three championships which is (needless to say) quite an accomplishment for a rookie. Kyoko is retiring in January so this level of excitement won’t last much longer, but for the short term its definitely bringing something different to Joshi to have a mother/daughter combination being so incredibly successful. Expect to see more of Kyoko and Hana over the next two months, as no doubt Kyoko will continue wrestling regularly in Stardom and JWP leading up to her retirement, and her daughter will be right there with her. Their next big match is on October 16th in Sendai Girls’ as they wrestle together on one of the biggest Joshi events of the year. There is still a lot of controversy surrounding SEAdLINNNG wrestler Yoshiko, and for good reason. Since the incident in January of 2015 against Act Yasukawa, where Yoshiko intentionally seriously injured Act, it is safe to say that there are many that don’t particularly want to watch her still having success in the wrestling ring. While I certainly wouldn’t defend her actions, in the history of wrestling no wrestler has ever been blackballed, it can be a bit of a seedy business sometimes. Wrestlers have even killed people and still continued their wrestling careers. It isn’t something I can say is a great idea but the fact is the wrestling promoters and other wrestlers tend to care more about making money than taking moral stands. Plus, Yoshiko was only 21 at the time, which is incredibly young to be blackballed from your chosen profession. 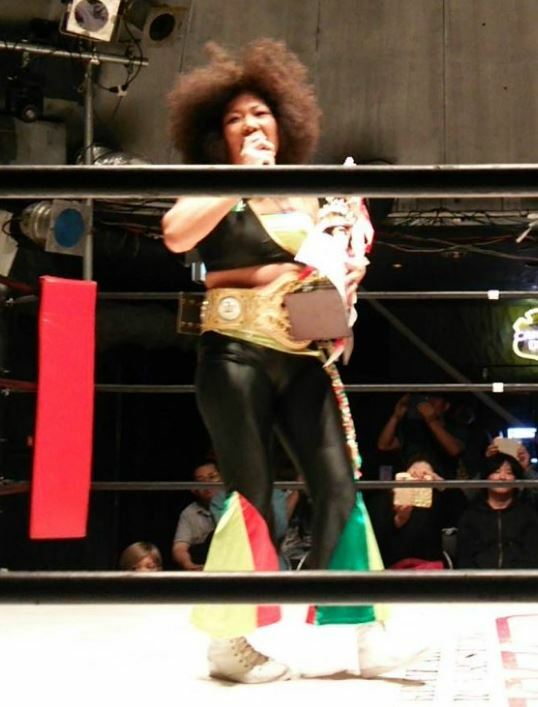 Since returning to the ring in early 2016, after a year away from wrestling, Yoshiko has been pushed by SEAdLINNNG as the promotion’s young ace. The crowd appears to have embraced her and the promotion’s attendance is in line with other mid-range Joshi promotions at Korakuen Hall. Yoshiko has also wrestled in a number of other promotions this year while representing SEAdLINNNG, including Pro Wrestling WAVE, Sendai Girls’, Diana, Oz Academy, and JWP. Her wide range of participation shows that whatever she is saying behind the scenes is working as there is little sign that her incident with Act Yasukawa is still negatively impacting her career, aside from her exclusion from Stardom. It certainly isn’t my place to tell people that still don’t like Yoshiko to change their mind, everyone has to do what they feel is right. But on Joshi City, as people probably noticed, I haven’t stopped covering Yoshiko or SEAdLINNNG and give them the same amount of coverage as any other wrestler or promotion. Not because I support her actions, but instead of trying to figure out where to draw that line I have opted to not have a line at all. If TARU and Jimmy Snuka teamed on a major Joshi show I am sure I’d cover that too. Where her career goes from here will be interesting, as while she is the young rising star of SEAdLINNNG, SEAdLINNNG is a small promotion that only runs shows every two months. It is not something people want to think about, but in a year or two if Yoshiko makes a stunning return to Stardom to challenge Threedom it would instantly be a hot rivalry, and remember that when Yoshiko ‘retired’ from Stardom there were several wrestlers there that tried to convince her to stay (either for storyline reasons or because they really felt that way). How that would impact their popularity globally I am not sure, but it certainly would cause a lot of interest and conversation, two things that wrestling companies love. I guess we will just have to wait and see if Stardom/SEAdLINNNG ever cash in on what could be the hottest rivalry in Joshi. If you need any help finding the matches after they air or just have questions/complaints/remarks, I can be reached at kevin@joshicity.com or through the Contact page at the bottom. Thanks for reading!